On the occasion of the 70th anniversary of the foundation of the Indonesian military, Commander Major General Hinsa Siburian reportedly gave a speech apologising to the people of West Papua for the Indonesian soldiers’ excesses and unethical actions. However, it is questionable whether or not this symbolic apology will have any positive impact on the community’s daily life under Indonesian rule. An Indonesian military commander in Papua region has officially apologised to the people of Papua for unethical actions of soldiers. 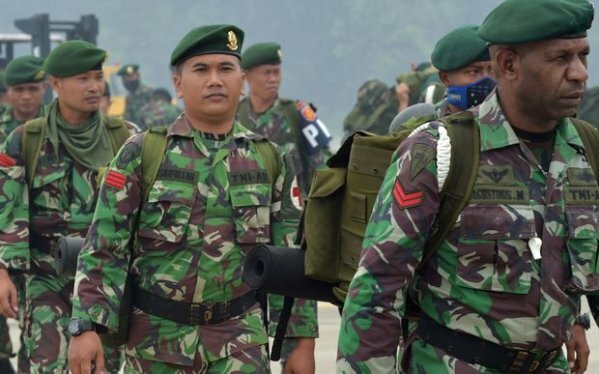 Cenderawasih Regional Military Commander Major General Hinsa Siburian made the apology in a speech marking the 70th anniversary of the Indonesian military. West Papua Daily reports him as saying he hoped excesses would not occur in the future, and soldiers could focus on developing Papua. The commander and other top leaders have been emphasising the military's role to protect the republic of Indonesia and its people. Meanwhile, the Governor of Papua province, Lukas Enembe read a speech conveying a statement by the President of Indonesia Joko Widodo to commemorate the anniversary, saying the Indonesian Military was born from the 'womb' of the people. The Supreme Commander General Soedirman also said the relation of Indonesian Military and the people were like the fish and water, which it could not live without water.